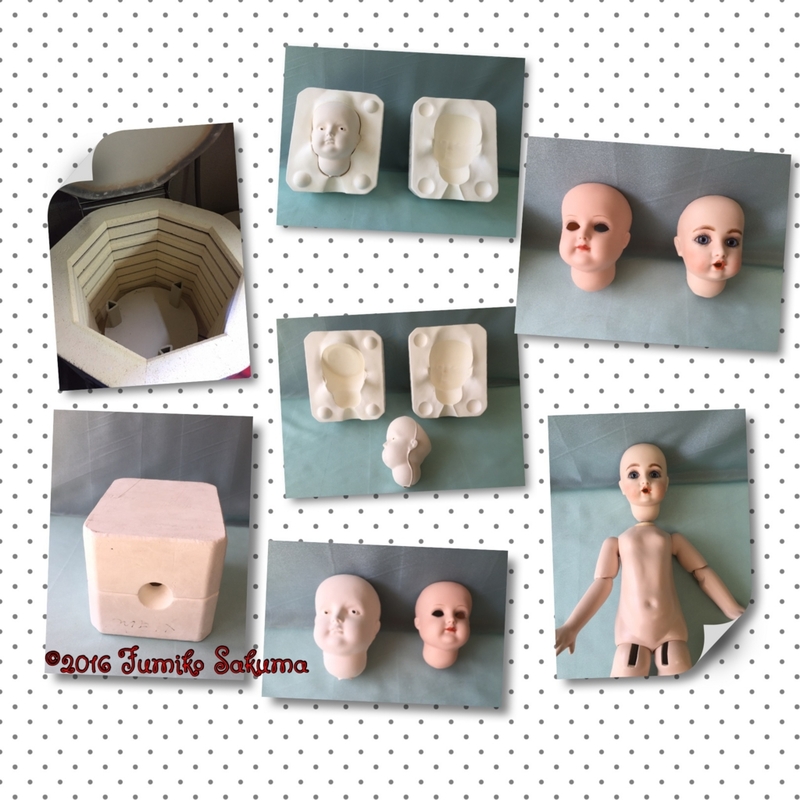 A frequently received question is whether a bisque doll is an already made product or a handmade doll. All my bisque dolls are produced at home. See photos for the processes. If I have a chance, I want to explain about the processes in detail, but as you can see, the processes require high level of handmade work. All molds are imported ones. After first heating parts at 700C (1300F) (the parts are very fragile), the parts are painted and second heating/baking is at 1200C (2200F). Then the eye holes are punched out to the eye size. As you can see, the entire size shrinks - around 13.6% - to a final size. The 3rd heating/baking is at 700C again after painting the face color, then the 4th heating/baking is done after finalizing face. Then you get a cute face! Bisque originally means "heating twice" - but for better quality I heat 4 times. In this kind of case/doll, the body has parts which allow some movement and you can see various impressions by moving the parts and changing the light effects. (After attaching the eyes, the eyebrows are painted. The mold shown is a different mold. The one made by the mold is now exhibited and sold at Yokohama Doll museum).